When it comes to healthy food, I pretty much like everything. I’m the opposite of a picky eater. I love eating new and interesting foods. Organ meat, fish eyes, insects – bring it on! When it comes to food, as of yesterday I am fearless. I even have a spreadsheet of food challenges. What happened yesterday? I tackled my only remaining food nemesis: the orange. 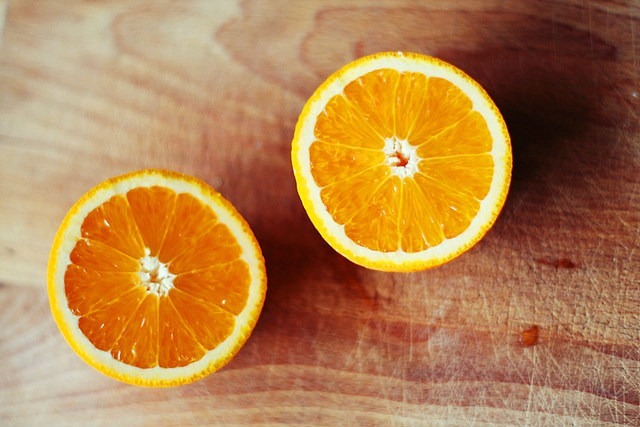 I told the story of how I grew to loathe oranges in the 2007 post Why I Don’t Like Oranges. Is it OK to have just one irrational food fear? Maybe. But for me I decided it was no longer serving me. It had been almost 20 years since the airport incident. Did I really want to avoid oranges for another 10 or 20 years? No. I started the process of warming up to oranges years ago. In the early 2000s I started with fake orange flavors, such as Tang and orange Popsicles. In the past two years I have been drinking more and more orange juice. I started with the no pulp and then mixed in some of the pulp varieties. My issue with oranges was never really about the taste. It was the smell. I know that sounds weird, but go back and read the story link to understand where I am coming from. Yesterday I put on some kimchi gloves and cut up an orange into slices. Kimchi gloves are those thin loose fitting clear plastic gloves sold in Korean grocery stores. Then I ate the entire orange down to the peel. Afterwards I smelled the peels. This is something that would have caused a gag reflex just a few years ago. I was fine. The smell wasn’t pleasant. It was neutral. A huge win. I defeated my fear of oranges. I still have a few rational food fears, such as french fries cooked in vegetable oil and dark roasted coffee. But now I can eat any healthy food. I no longer have an issue with oranges. Do you have any irrational food fears? Any interest in overcoming them? I have a somewhat irrational fear of onions, which is a shame because they are in everything. I don’t even have a good reason for it. I just think they are gross, especially when raw and crunchy. I love garlic though. Wait… Dark roasted coffee? Crap, what have I missed? @Bryce – Most dark roasted coffee tastes like an ashtray. I much prefer lighter roasted coffee.